Based on a genuinely moving true story, this film undercuts the realism by pushing its heroic machismo at every turn. It’s a well-made movie, with an above-average cast, and yet both the story and characters are neglected in the rush to honour the real-life men who risk their lives fighting wildfires. Thankfully, there are some strong, quiet moments along the way, and the story itself carries a proper emotional wallop. 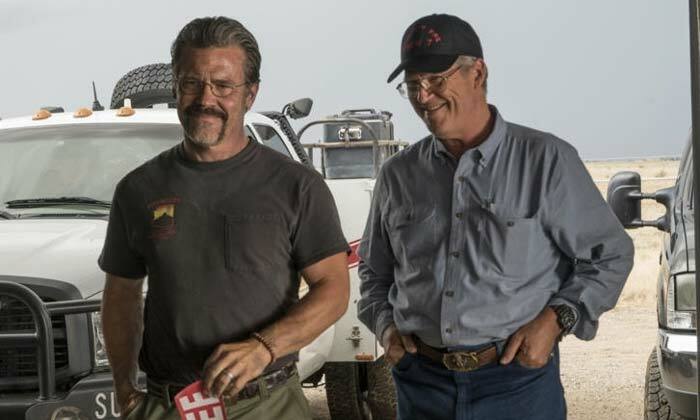 It’s set in Prescott, Arizona, where Eric (Josh Brolin) is trying to get his firefighting team certified as hotshots, qualified to take on the big wildfires. Supported by fire chief Duane (Jeff Bridges), he builds a crew that includes loyal captain Jesse (James Badge Dale) and talented womaniser Mac (Taylor Kitsch), and he gives a second chance to Brendan (Miles Teller), a recovering addict who reminds Eric of himself. Then when the crew is certified as the Granite Mountain Hotshots, the pressures of work strain their relationships with their wives and children. Indeed, Eric’s strong-minded horse-trainer wife Amanda (Jennifer Connelly) is annoyed that she’s now seeing even less of him than before, but she supports his passion for the job. Thankfully, all of the actors find small details that bring these people to life. Teller has the most well-developed character, and digs deeply into his emotional core. And a feisty Connelly adds an edgy kick to the film. At the centre of the story are the mentor relationships between Duane and Eric, then Eric and Brendan, and while this feels a little forced in its depiction of the legacy of the profession, it gives the film a nice sense of resonance. So it’s a bit frustrating that the story’s subtle power is drowned out by all of the tough-guy masculinity. And the movie would have been a lot more inspirational if the filmmakers didn’t try so hard.